We want to capture your day as it happens, from the small details to the big moments. We want to photograph the real emotions and feelings. We have a very relaxed approach, and by photographing your day naturally, we are able to capture your wedding as a whole, leaving you with beautiful photos of moments you may otherwise have missed. Having two photographers means that we can capture your day from two important perspectives: showing not just the looks between you both, but your guests reactions as well. Our highlight videos are filmed in the same relaxed and natural style as our photos. These are a collection of clips shot throughout your day, carefully edited together into a 3-5 minute film with music, allowing you to relive those special moments. They are the prefect add-on to your photography package, giving you that something extra special to have together with your photos, capturing the atmosphere and happiness of your day! With both of us filming these alongside our photos, this allows us to get take snippets of those exciting moments without you feeling like you're being followed around by cameras all day. 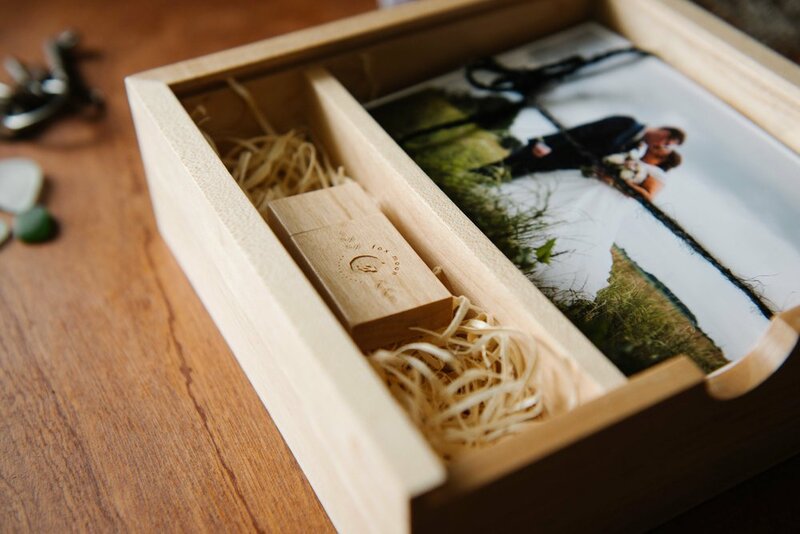 Included in our wedding packages are our personalised wooden photo boxes, a perfect keepsake of your special day. 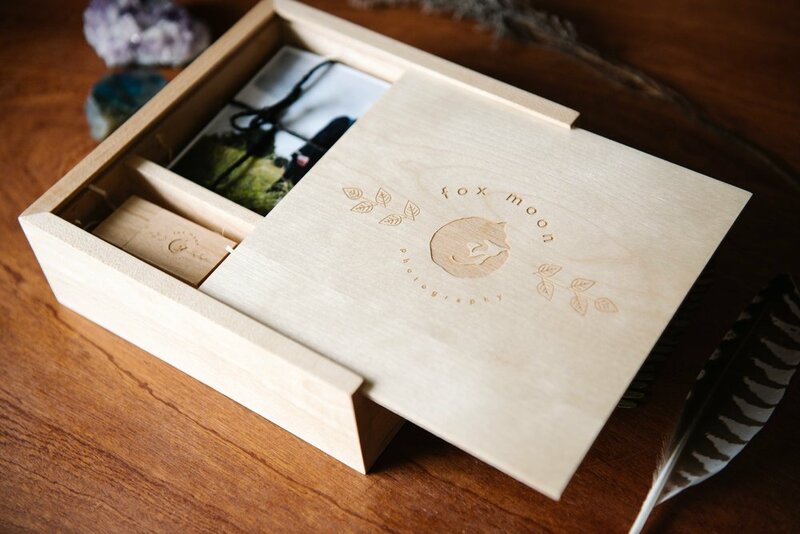 These boxes come complete with a high quality USB 3.0 memory stick, full of photographs from your day, along with a little extra gift from us to you. Our beautiful, flat-lay fine art photo albums are made with the highest quality long-lasting materials, and tactile cotton paper. They're also fully customisable with your names, colours and favourite photos. "We just cannot say enough good things about Fox Moon. Meg and Scott, you were amazing from start to finish, and we’re so grateful for all your hard work. From the first meeting in a coffee shop… to you delivering the INCREDIBLE box containing the USB, your professionalism, gorgeous presentation and attention to detail have been brilliant. It felt like we gained two extra friends for our day, and you really helped us to relax and enjoy ourselves. The photographs we have are excellent, and you’ve captured such amazing moments (Max’s flying heel click in the church being just one!) We will never be able to pick our favourite photo! I could ramble on for ages about how incredible you are but I’ll try to stop now - needless to say, we are recommending you to everyone! We can’t thank you enough, and will hopefully be able to pick some for an album soon!" "Meghan and Scott you two are just amazing!! From the moment Rose met you at the wedding fair... to when you finally decided to go home from our wedding you were wonderful. You made us feel so comfortable, the amount of people who thought we were old friends made that even more obvious. 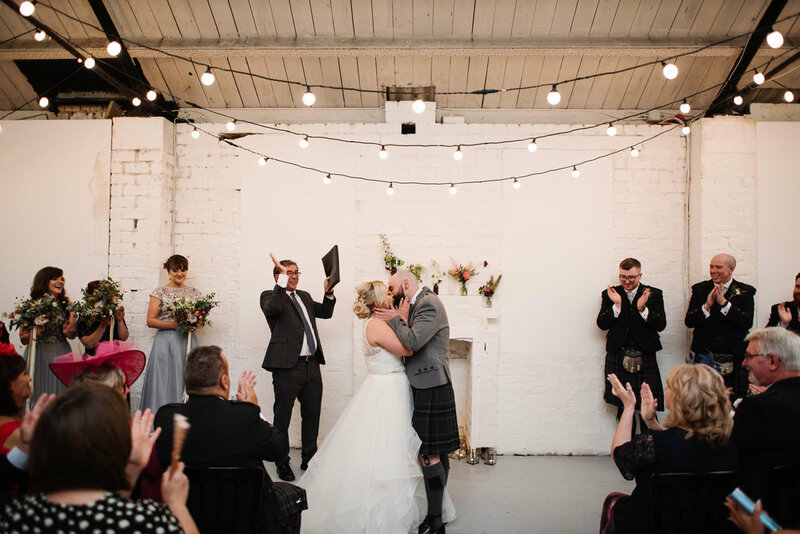 We were both so pleasantly surprised by the amount of beautiful photos you managed to capture of our day and we couldn't recommend you highly enough to anyone looking for wedding photographers. You’re laid back, discreet way of working was just perfect for our style of wedding and us as a couple (not being the posey types). We are both so so pleased with the results you produced, the whole process of working with you and the little things that really made us like you two! "Thank you so so much. Would highly recommend to anyone! Absolutely love our wedding photos that Meg and Scott did for us. I hate my photograph being taken but felt so comfortable around these two. They are extremely talented and relaxed and have a very unique and original way of working. We had two ceremonies… and in my opinion I preferred the way Scott and Meg worked as it is much more natural and they capture some very special moments throughout the day, not only doing the group posed shots but their attention to detail means we received some photographs of moments which myself wouldn't of seen other wise. 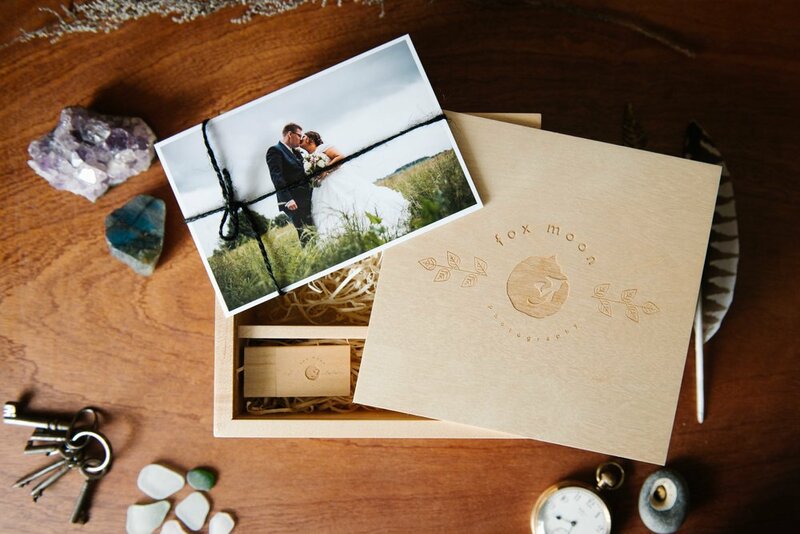 The professionalism of Fox Moon Photography and cute rustic keepsake box that came with the photography package has made our whole wedding experience perfect." "We really can't find the words good enough to describe Meghan and Scott... These two amazing people were just like guests and felt like part of the family. Meghan helped my mum fasten me into my dress. They both played with our kids, they went back and fourth with our wedding co-ordinator and made sure everything went perfect. All our family commented on how fabulous they were and I couldn't agree more, we will recommend them to everyone I know. They are also such a fabulous couple together, which just adds to the specialness of the day, thank you so much."